Zimbabwe’s Robert Mugabe has defied widespread calls to quit as president, telling the nation he would “preside” over his party’s next congress. This follows his dismissal as ZANU-PF leader by its central committee. Mugabe, surrounded by military and civilian officials, gave a rambling televised address Sunday evening, telling Zimbabweans they should respect 1980 independence war veterans and reconcile “inter-generational” differences. The Central Committee of his ruling ZANU-PF party had earlier ousted him as party leader and given him until noon Monday to end his 37-year-long reign as head of state or face impeachment. 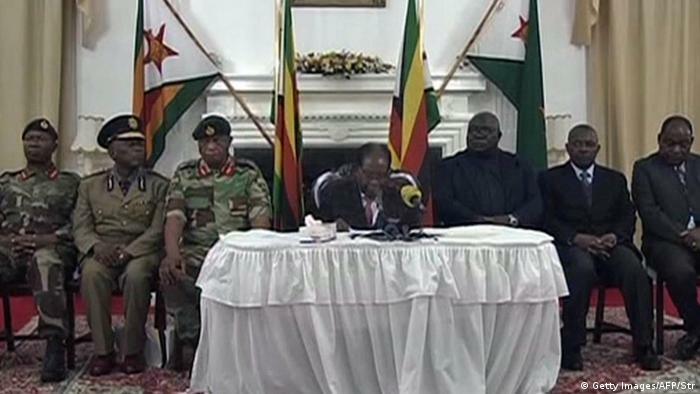 However, Mugabe made no references in his speech of his party’s moves to dismiss him. Instead, he said he acknowledged what he termed “a whole range of concerns” raised in a “spirit of honesty” by elements of Zimbabwe’s security forces during the past week’s military intervention. Reportedly waiting in the wings as potential Zimbabwean president is Mugabe’s recently dismissed Vice President Emmerson Mnangagwa. Tens of thousands of people had poured into the streets of Harare on Saturday to demand that Mugabe step aside after overseeing the once-prosperous country’s economic collapse. A coup that's not a coup. A resignation that's not a resignation. Reality in Zimbabwe isn't real here. I told you that introducing bond notes was a bad idea.??? Generals took over last Tuesday after it emerged that President Mugabe had fired Mnangawa and was set to install his highly unpopular wife, Grace, in the position. Mugabe was put under house arrest while refusing to step down as president after initial talks with the army. With many jubilant at the end of repressive and economically disastrous Mugabe era, there are concerns that the military takeover last week will not herald a period of change, but rather, will continue the status quo. By refusing the acknowledge that events amounted to a coup d’etat, the military appears to be trying to avoid triggering an automatic expulsion from the Southern African Development Community (SADC) and the African Union. According to Chris Mutsvangwa, leader of the liberation war veterans who have been pushing for Mugabe’s ouster for the best part of 18 months, parliament will move to impeach the president when it next sits on Tuesday. He also implied that Mugabe simply had not been aware when he gave his speech that his ZANU-PF party had expelled him hours earlier. Similar threats of impeachment were made by the ruling party’s chief whip, Lovemore Matuke. While Mugabe’s refusal to resign had come as a surprise, Matuke said he didn’t see it as an obstacle to the president’s impending impeachment.